India is driving me crazy. I want to take my family there. I want to fit it all in. I know I can’t. What is a mom to do? I am stuck… between “planning” a trip to the north or “planning” a trip to the south. I know I should be able to decide but I can’t. Tea Plantation – I am obsessed with tea plantations but have never been. Strange, I know. I just love the pics of them so much. Hampi – An IT PLACE that travellers go on and on about – I want to be one of those travellers – Walking and biking through the ruins, water running through the area, great sunsets, local people who pilgrimage there, a place to wander. Right up my alley. Help! Advice? In any event, it will be an experience. I remember when I went to Nepal. I was in Bangkok and looking at flights. There was a cheap one to Kathmandu and off I went, not knowing much about it, but wanting to go. Certain countries have an allure to them, a certain mystique that is hard is to describe. Walking the streets of Kathmandu I loved everything about it. It was chaotic, colourful, that kind of perfectly imperfect place that I tend to love. I hadn’t been to India yet so it held that extra special place in my heart as I watched the ghats and the cremations from afar, met saddhus around temples and simply just wandered around. Pokhara was special as I read Into Thin Air looking out my hotel window at Mt. Everest, the place where it all happened. Lately, in response to Abby’s announcement, I have looked into Nepal again. A lot has changed over the years. Kathmandu is described less fondly; more traffic, more pollution. Oh well… I doubt those minor details will stop Abby on her quest. 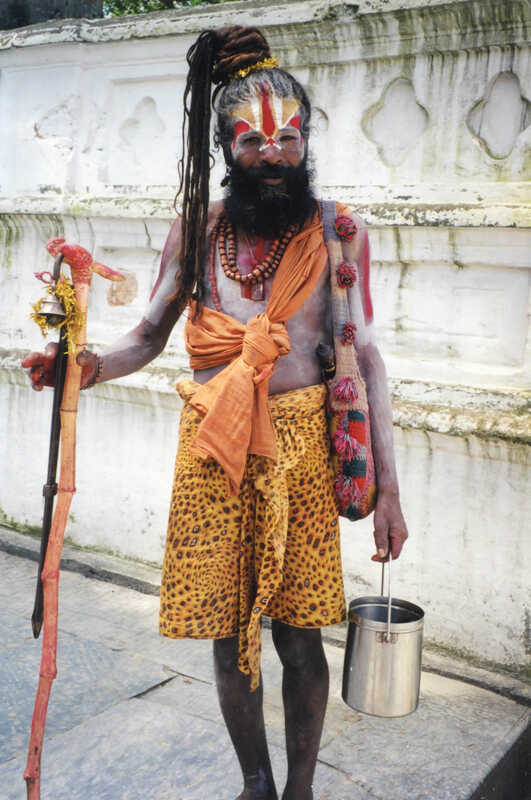 A holy man (sadhu) in Nepal. I was just leaving the temple with my dad somewhere in Rajasthan, India. There was no one around except for her; a youngish girl, carrying home water. She waved and I walked over. We couldn’t talk to each other but we could smile. Immediately I felt awkward. Our driver in our rental car was waiting for us. We waved good-bye to her. She continued to walk; with the heavy jug on her head. I know because she had let me hold it. Driving away, moving on I looked back at her. It didn’t seem right. In fact, it wasn’t. At least, we could have offered her a ride. But we hadn’t. Yes, feeling guilty. A common feeling I experienced in India. Oh you won’t believe how I have gone on and on about you to my family. I know it was many years ago that we met and that I fell in love with you and I fear, that with so much time passed, that you will have changed. Or maybe I. Some people think that I should not return since what we had will never be the same. I know that might be true. I have heard some rumblings and have scoured some notes and I worry. You used to be so safe; I could go where ever I wanted to; carry what ever I wanted to; but now I have heard that caution might be necessary. It is probably not your fault. I don’t know. Having so many more people come through your works of art, tread through your painful history, change your quiet scenery must be overwhelming and even confusing at times. Recently I met someone who had just visited you and his complimentary tone made me so relieved and happy. He remarked that you are still so very special; fostering compassionate, understanding and open people; a people who have faced so much and courageously moved on. With smiles on their faces and warmth in their hearts, they still welcome people like me who are eager to experience all the amazing gifts you have to offer. I am thankful for that. I am hopeful that soon we will meet once again and that we will discover, that despite appearances having changed, that deep inside we are still the same. I realize that it gets worse every January… it just rolls around… spitting at first, then pouring, and then soon I am drenched as there is a full-blown thunder-storm of monsoon proportions. The urge to travel…I can’t quite quiet it down. As we are more of the “once a year we take a big trip” kind of families (although I could change that up in a second if a jackpot came our way), January is the middle of my travel road. The memories of that last trip are beginning to fade and the NEED to do it all over again begins to BUILD! I am sure some of you can relate. I care about those things…really I do… BUT I really dream of them travelling. You know when you have that “scare”, that kind of “scare” that rocks you to your core, keeps you up at night, and makes you re-evaluate your life. I had one of those last year (fortunately it was all fine) but during that scare and post-scare, this is what came to mind. Nothing can happen to me until I know my girls have travelled to Cambodia (my first love) and to India (my second love). I realize that this is not normal… well for many of us… but I will sleep much easier once I know they have experienced these two special countries. It started a long time ago for me and has continued now that I travel with my family. I am a “buck the traditional” kind of woman (“maiden name” – ridiculous words… but I still have mine; quit “traditional” law the minute I became a lawyer; had one daughter and ended up with four daughters (happily); changed careers many times and probably will once more. So needless to say, it is not a huge surprise that my favourite cities are NOT Paris and London as I much prefer grittier Amsterdam. 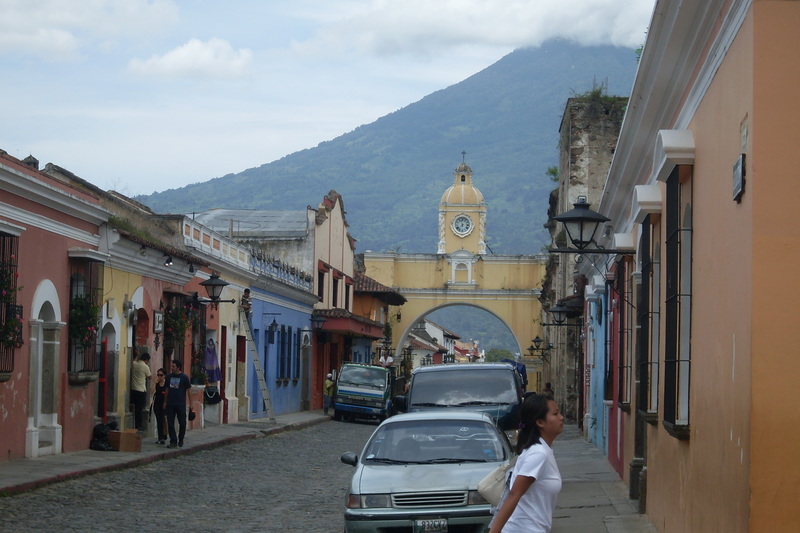 When choosing Spanish language schools in Guatemala, Quetzaltenango beat out perfect Antigua so it was not too shocking that as a family we preferred Lake Atitlan villages again over Antigua, the “jewel” of Guatemala. After visiting Mexico, Chris declared Patzcuaro over San Miguel de Allende, another “expat haven” which is “perfectly aesthetic” but less us, I guess. Hands down we loved Essaouria over Marrakech and Fez in Morocco, strangely for some but again that is how we roll. I do have to admit that I love Bangkok but not for its touristy temples or other “must see” items. I prefer to wander, explore, people watch and get lost. Phnom Penh is my idea of perfectly “imperfect” but that was years ago, and I fear that it might have changed; as most places do. And I know I am very odd… but Cape Town was not a favourite for me; it was beautiful but not me. I much preferred the wild scenery of Lesotho, Swaziland and parts of Kwazulu Natal. When I look at my pictures, I gravitate to the regular, to the gritty side of life. Maybe that is why I am so obsessed with India because it has both; perfect and imperfect; all at the same time. Soon two of our blended family may be headed to a new city (one that when we tell people, the response is usually… umm) so granted to say, it is no Paris, no Vienna, no Florence, no Singapore. But because it will most likely be “perfectly imperfect” , we are not worried, we will be content and of course, find things to love. Are you thinking about a first trip (or a second) to a very special place that is close to North America that is family friendly, wallet friendly, and provides major bang for your buck? We strongly think Guatemala is that place. This is our trip report from ThornTree (Lonely Planet on-line resource). We went on an amazing three-week trip to Guatemala with our 12-year-old daughter. It was her first time outside of Canada/US and she has now fallen in love with Guatemala, as we have as well. Although it was my second time there (last time was 18 years ago) it felt just as wonderful as many years ago. We arrived late in Guatemala City and had made earlier arrangements with our hotel (Dos Lunas) to have their driver pick us up at the airport (included in hotel price). Victor was a wonderful sight to see as we tiredly left the airport feeling very secure and safe with him. We arrived at a gated community 5 min from the airport to meet the amazing couple, Lorena and Henk. They made us feel at home right away. I can’t recommend this hotel enough as a great start and end to a trip. The next morning Lorena made arrangements for a shuttle to take us to Panajachel. My daughter’s eyes were wide open as we drove on the road to Lake Atitlan (her sitting in the middle front seat of the shuttle). We arrived in time to eat at the Sunset Cafe ( beautiful location at the end of Santander Calle) and despite no sunset, it was still ideal and worthwhile. Jade really enjoyed Panajachel as she found it an easy place to shop without a lot of the hustle/bustle of a busy market. 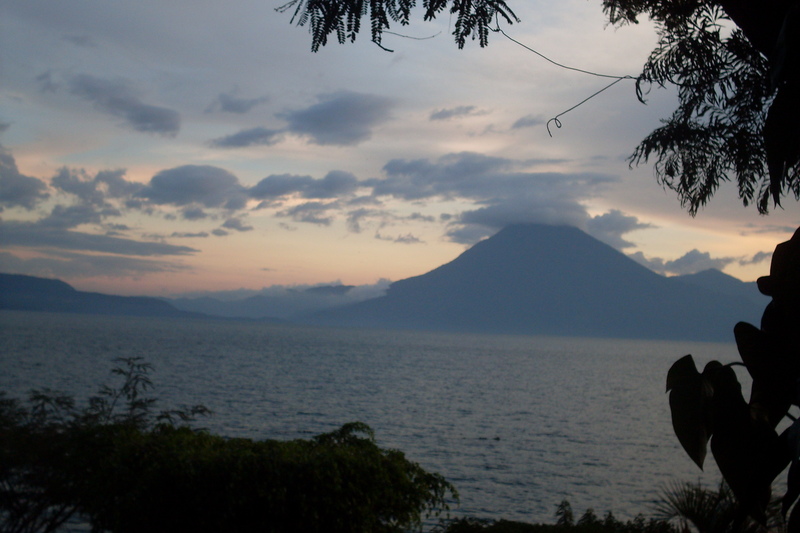 We then took the public boat to Santiago Atitlan where we stayed at Posada Santiago. Our decision to stay at the posada was a difficult one (I had been thinking of many including Casa del Mundo) but it turned out to be the best choice for our family. I loved having the convenience of staying at the Posada which was a short walk down the road from a community where we could walk around and enjoy everyday life. The food/lodgings at the Posada are amazing but what was most amazing was its pool/jacuzzi set right by the lake. I spent a lot of time in the pool/jacuzzi watching the lake activities and men fishing in their cayucos. We would wake up early in the morning and walk down the road (2 min) to watch the women washing their clothes in the lake and gather water. While sitting in the restaurant in the Posada, we could observe men carrying large bundles of wood walking between the villages. Women and men in typical clothing for their area were everywhere and my daughter’s eyes were wide open all the time. 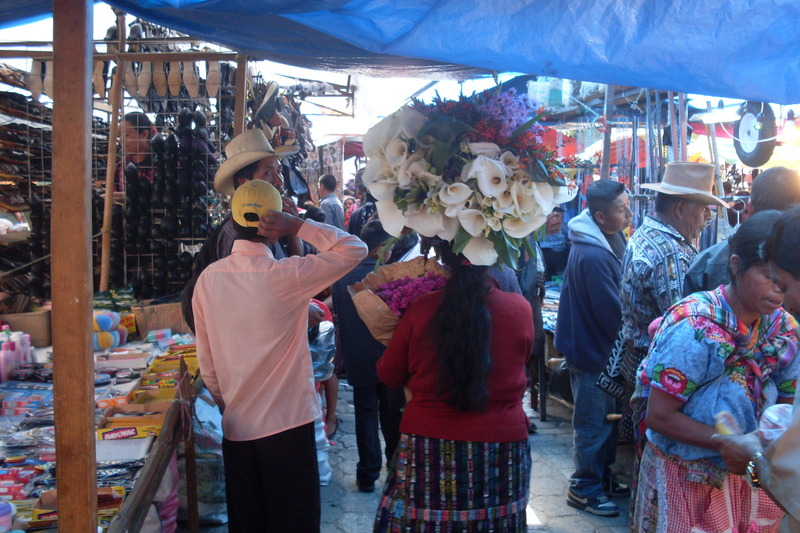 While at the Posada, we visited Solola market and had been warned that many pickpockets (women and children mostly) would be around. Both my daughter and my husband had their pockets searched which did worry my daughter a bit. It is a very busy and at times, tight market which can become a bit claustrophobic. My daughter needed to take a few breaks from all the activity which was easy to do a block or so away from the market. Overall it was a positive experience and I enjoyed it much more than I had Chichi 18 years ago – just don’t take a day bag and wear a money belt under clothes. The chicken bus up the twisty and winding road to Solola was an adventure in itself but both my daughter and husband enjoyed it. We also spent one day in San Pedro where my husband got his hair cut. Our daughter enjoyed watching it as this has become a bit of a tradition when we travel. Each haircut experience is always different. 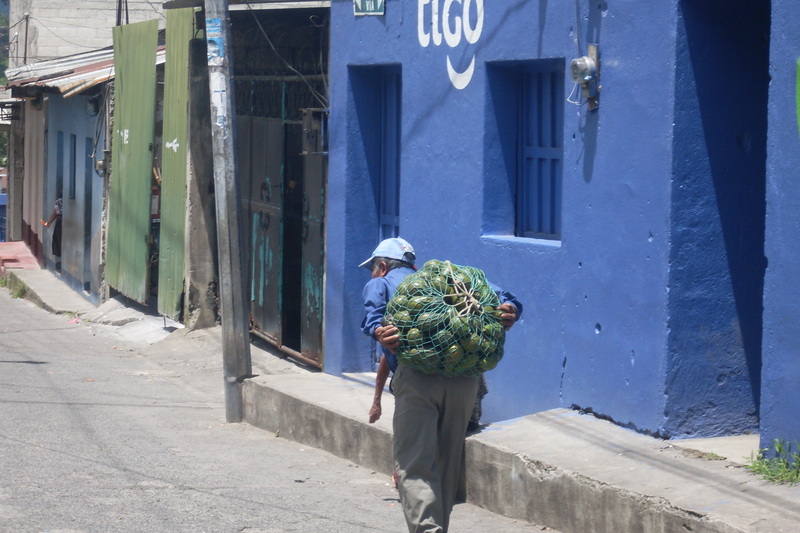 We enjoyed San Pedro and liked the feel of the village up the hill. On the way down the hill, we saw a white church (not Catholic) and we were given permission to climb up to the top of it where we got amazing photos of the surrounding area. We then went to Antigua where we stayed at Posada Juma Ocag. Although it says in the LP that you can’t book ahead, we did through its website. It was a friendly, cheap and secure place to stay right across from the market. We loved it there! My only note to mention about Antigua is not to use El Barco Travel Agency. I always follow posters’ advice and my guidebook but this time did not and we paid for it. We were tired and hungry and just stepped foot into the first agency (thinking that all Volcana Pacaya trips must be the same). They scammed us twice (yes… not good) and we ended up going a day later than we wanted in a 12 person van filled with 20 adults. On the way back, a tire blew going down a large hill and so we were happy to finally return to Antigua. So a word of warning… avoid El Barco at all costs. One of the best things we did on our trip for our daughter was to do a tour with the NGO, Safe Passage (Camino Seguro). We arrived at their office in Antigua and they drove us to their work in Guatemala City. I had found out about the NGO on a family blog site and this NGO has strongly impacted my daughter’s life and her vision for her future. They took us to the Guatemala City garbage dump where we learned about the families who live around the dump and try to make a living off of it. We learned what the NGO does for the families encouraging kids to stay in schools and participate in before/after school activities. Watching the vultures fly over the dump and witness the women and men running along side the garbage trucks vying for a great position to sort through the garbage is something we won’t forget. We then flew to Flores ( in the evening) and stayed one night at Hotel Santana which is beautifully located on the lake. 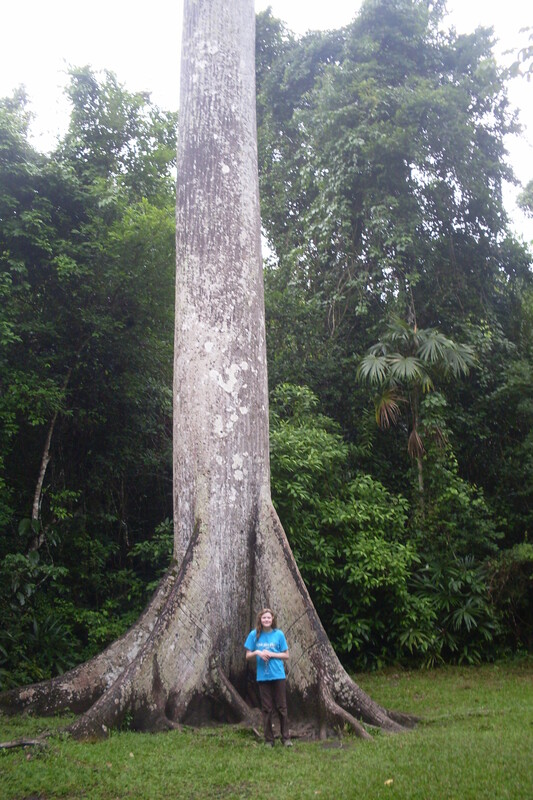 We took a shuttle to Tikal the next morning where we stayed at the Jungle Lodge. I would recommend the Jungle Lodge for one main reason… each day at 4 or 5pm. the spider monkeys come out and you can swim in the pool and watch them as they play in the trees hanging over the pool. My daughter was in heaven. Our favourite thing on our trip was the sunrise tour (an absolute not to miss event) of Tikal which I remembered clearly from 18 years ago. We went with our guide Carlos (thru Jungle Lodge) and he was amazing. He is a very educated man who made Tikal come to life for our family. As Carlos can’t walk well (moto accident) we took a truck into the jungle at 4:30 am. Standing in the back of the truck holding on for dear life, listening to the howler monkeys wake up… was “better than Disney World” said my daughter. After we went to Finca Ixobel in Poptun. This is the only time that it rained during the day in our 3 weeks which put a damper on the Finca for us a bit. There is not a lot to do there when it is raining. Despite the rain, my daughter and husband decided to trek to the Ixobel cave... a major up and down hike in the jungle for an hour. I am happy they did not do the longer trek to the river cave as this would have been too long to go in the high humid and wet jungle. Although they enjoyed the cave experience (seeing bats, spiders while holding flashlights and candles – with no holders!) my daughter said she wouldn’t have done it again. They were beyond wet and muddy when they returned. Initially my husband wanted to wear his sneakers but luckily they convinced him to wear rubber boots as his sneakers or hiking boots would have been totally wrecked if they had been worn in mud up to their knees. Finca Ixobel does have amazing food but we felt a bit out of place there (staff was so so friendly and not many other tourists around except American “military” maybe). What I dislike the most was their mosquito nets which were covered in large patches of blood! We then went onto Rio Dulce where we had arranged through Hotelito Perdido to pick us up and take us to their jungle bungalows. They were very well-organized and met us at the exact time/place they said they would be there. Aska the owner ( whom we had made the arrangements with) no longer lives at the Hotelito but she does have hosts who manage it for her. Daniel and Margid were excellent hosts. 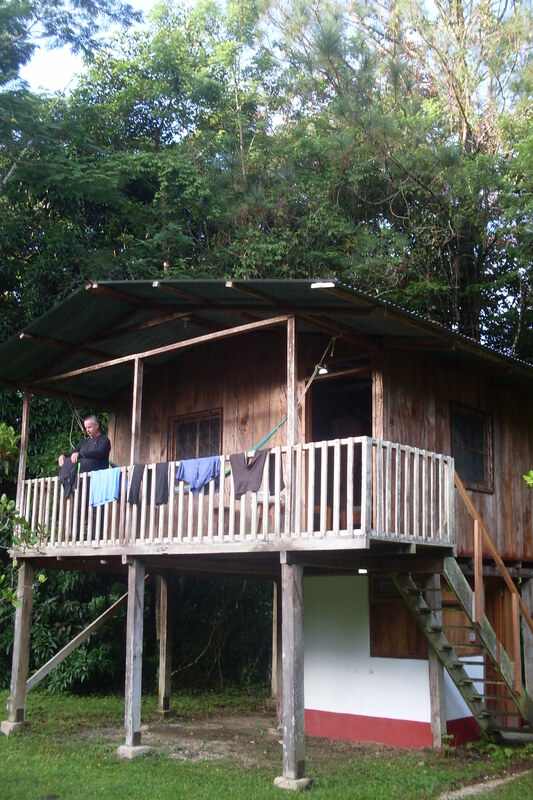 We were the only ones staying there… it is the rainforest and it is isolated. My husband found it a bit claustrophobic so our 3 nite stay changed to a 2 nite stay. It was extremely humid and hot in July (like nothing I have experienced before and I have lived in the jungle in Cambodia and Suriname before). There were a lot of creepy crawlers around including a spider much larger than my husband’s hand in the shower. 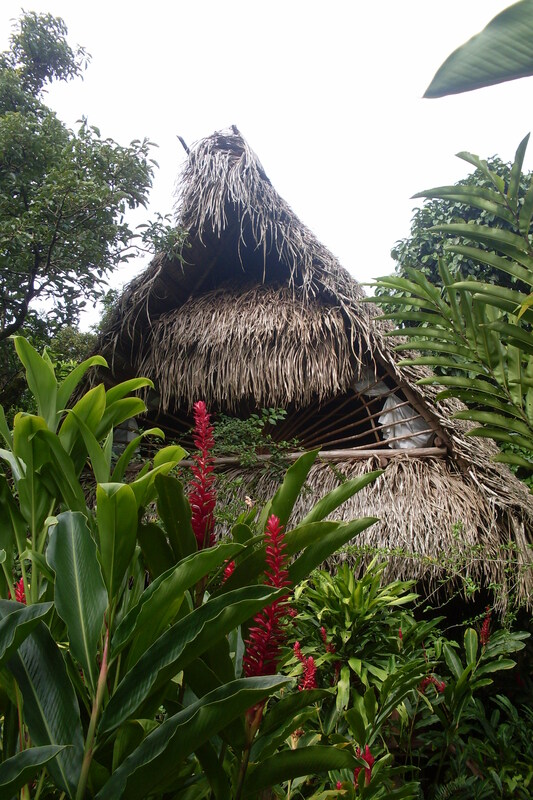 Our daughter staked out her place in a hammock while she read (it was safe from the creepy crawlers there ) and loved the Hotelito… while my husband went around removing insects that would worry her 🙂 An army of red fire ants moved us out of one bungalow to another. The bungalows are beautiful but are very much open concept. They are not completely screened in at all so many insects do find their way in. Overall, we enjoyed our time there despite the high humidity. The food was amazing… Candy the cook can cook many fantastic vegan options! Dining together at nite by candlelight with the sounds of the rainforest is truly memorable. We spent one night at Posada Delphin in Livingston which surprisingly was a real highlight. The pool was situated right on the water and it was very refreshing to have the breeze while swimming and watching boats coming and going. 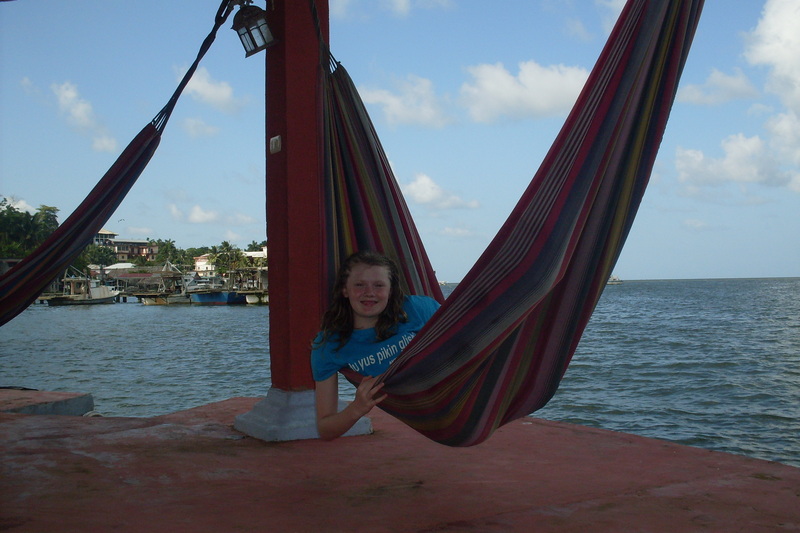 The best thing about the hotel were the hammocks at the end of the pier where we hung out at night watching the lightning show. (every night in Peten and in Rio Dulce area we had rain, thunder and lightning). Jade hanging out like she always loves to do when we travel. We took the first boat out of Livingston to catch the early Litegua bus from Puerto Barrios to Guatemala City.. was a double decker deluxe bus and therefore a relaxing 6 hr trip back. We had a wonderful memorable trip to Guatemala – a perfect choice for a family with a tween/teen looking to experience a different culture and way of life. I can’t wait to eat Chinese food again and see what the next one predicts. I will keep you posted. You just never know what a vegetarian chop suey has in store for you!!! I don’t even want to admit how many times I have googled – best family trips. meaningful family travel, where you must travel with kids etc. etc. etc. I have tried them all. It is pretty bad when you see that you have visited the same website over and over and you are still seeking that one stand out place, that maybe someone else knows of; that I don’t. I have stopped (well.. mostly). I have learned a few things since we started this blended family travel stuff. This is my new go to criteria. a different experience from previous – Jade had been to Guatemala so I wanted to mix it up for her next trip and chose Morocco (different language, customs, tradition, clothing etc. from Guatemala). And when all of the above fails, you will still discover that a trip to anywhere new is usually wonderful but remember to expect the unexpected!